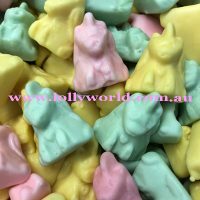 Unicorn Lollies in soft pastel pink, green and yellow fruit flavoured jubes. They have no artificial colours or flavours and are gluten free. There are approx 18 in a 100g bag, 36 in a 200g bag and 144 in an 800g bag.